The Titan Fitness balance ball trainer helps you strengthen and coordinate several major muscle groups including your core muscles, back muscles, legs, and abs. By adding an element of instability it forces your body to use more muscles from your core so you no longer have to rely on crunches or sit ups for your abs workout. The resistance tubes attach directly to the base for other body weight resistance exercises and add an extra dimension to your standard work out. 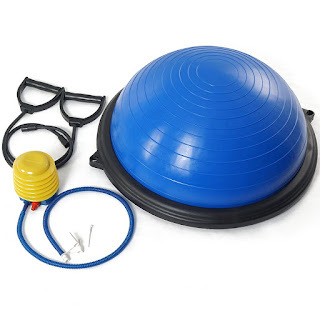 Perfect for physical therapy and recovery exercises. Appropriate for everyone from elite athletes to kids to weekend warriors trying to stay in shape, the balance trainer helps you strengthen and coordinate several major muscle groups, including the muscles you don't see. It targets your core muscles--the muscles around your abdominal and back area--while you perform a host of different workouts, from squats and bicep curls to lateral shoulder raises and hip extensions. As a result, you not only gain strength, trim, and tone, but also improve your balance and coordination along the way. In addition, balance training helps strengthen the mind, with thoughtful movement that requires the participant to not only be physically involved, but also "here and present" with the mind fully engaged. By combining physical and mental focus, balance training will boost your performance across a wide continuum of activities, including sports, recreation, and daily tasks. BUILD BALANCE & STABILITY: This balance trainer is made for all fitness levels, and all ages to be used for; rehabilitation, physical therapy, strengthening your base, improving balance and hip strength, and to be incorporated into high-intensity cardio routines for the fitness buff. This is the perfect addition to your home gym, portable for on-the-go fitness or a great addition to rehab offices or gyms. 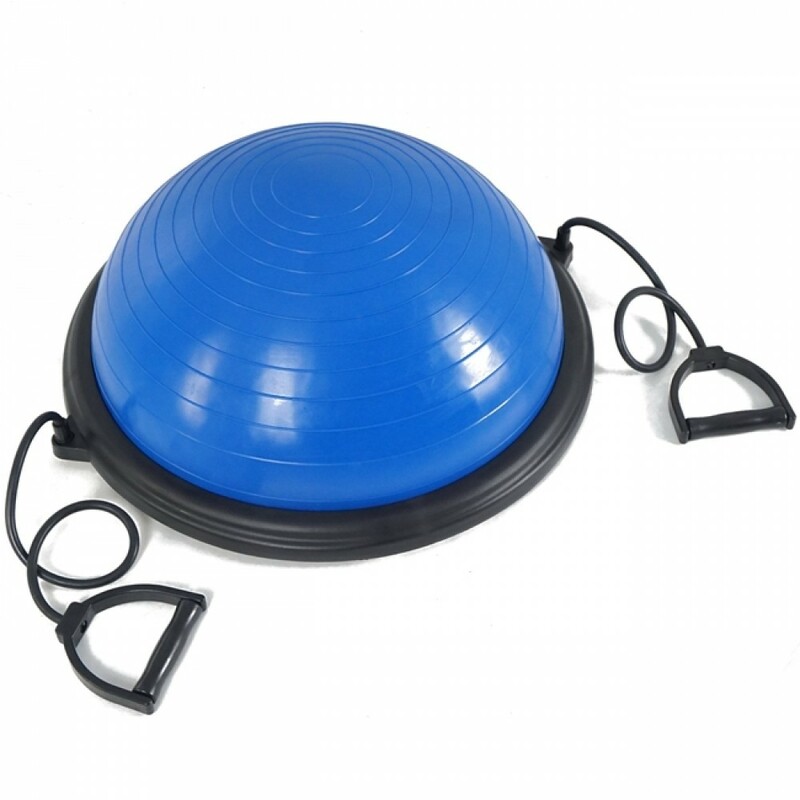 SAFE & SLIP RESISTANT: The slip resistant material will allow you to safely stand, jump, kneel, or lay on this balance trainer, for a worry free workout. Resist falls, improve your coordination and avoid muscle atrophy by using this for simple, easy balance training to build your core strength and stability. USE BOTH SIDES FOR A COMPLETE WORKOUT: This balance trainer is designed to be useful on both sides for a thorough training routine. Use the half ball with the flat side down to stand on for simple balance building, using a basic stance, or push steps. Advance your routine by doing squats, lunges, or using for crunches. Take it even further by flipping the trainer over and using for planks or burpees. 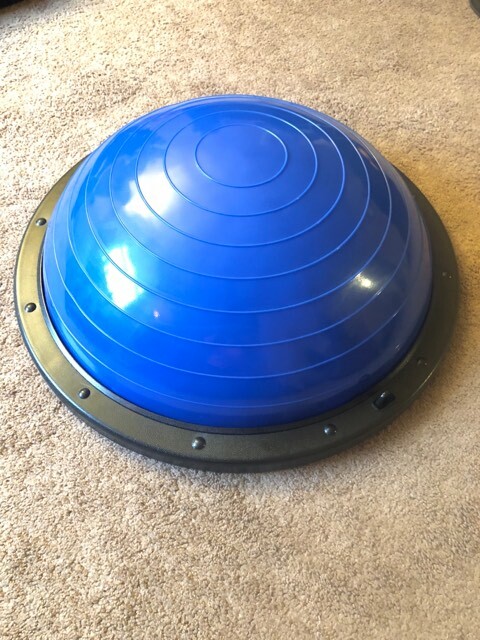 FINE TUNE SPORTS SKILL- Incorporate this piece of equipment when doing plyometric drills to improve both speed and power. It helps to exert maximum force for short intervals for improvement in sports like tennis, football, basketball and skiing. You can do various balancing exercise to strengthen the core. With the bands and the balance ball, you work out your whole body. 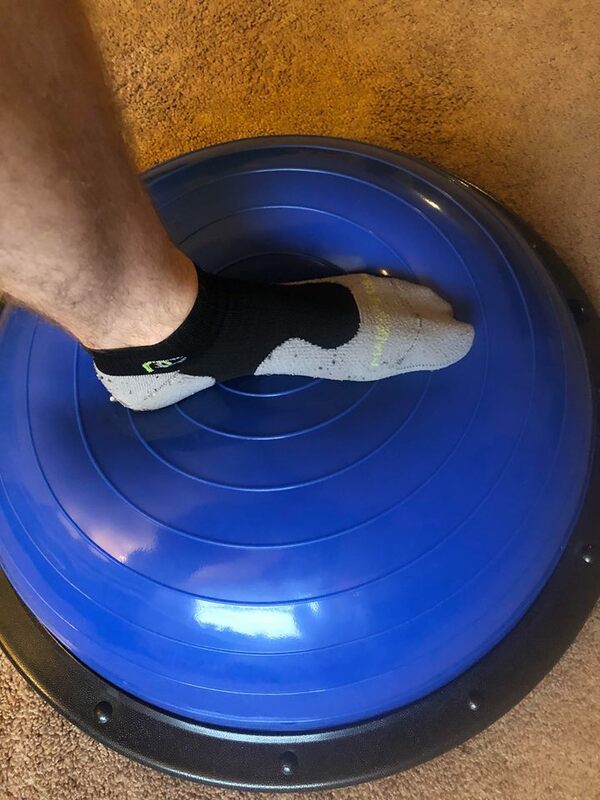 The bands are removable so that makes the balance ball trainer versatile if you want to flip it over and use it that way (although it's not recommended for safety reasons, I still like to plank with it and do body squats using the backside). As a physical therapist, the Titan Fitness Balance Ball Trainer is one of my favorite balance training tools. There are so many uses for it, and I often use it for arm/shoulder stabilization exercises as well. I also have found that they rarely require the addition of more air, so they are low maintenance pieces of equipment.